neverhomemaker: It's Thursday . . . Have some Naan! It's Thursday . . . Have some Naan! From the METHOD archives . . . A few nights ago, I set out to make naan, and I planned to use it in two dinners. Both worked beautifully. Some history . . . I have quite a love affair with naan. When I was in college, one of my housemates and I used to frequent this little Indian food joint, and I'd always get the same thing: one order of vegetable curry, one order of veggie samosas, and two -- count it -- TWO orders of naan. I'd eat one with the meal and save the other for the next day. Problem was, I've since moved, and I've been missing the meal ever since. 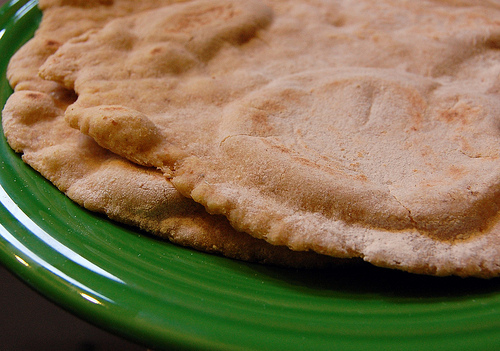 What I found out this week is that naan is both incredibly versatile AND super easy to make. In fact, you "bake" it in a cast iron skillet! So, I thought I'd start you all off with the basic naan recipe. It goes great with this morning's slow-cooker sweet potato/pea/cauliflower curry. That was meal one I made with the stuff. Meal two was a "breakfast" pizza atop the naan. It's pretty self explanatory, but tomorrow I'll give you my favorite breakfast pizza topping combination, as well as some tricks for avoiding a soggy result. Also note: The naan I made isn't exactly traditional. I mixed some different flours in because I mostly have wheat pastry flour at my house right now. Having just returned from vacation, I'm low on other supplies too. So, below is the original recipe and in (parentheses) are my substitutions. Oh, yeah. And this recipe makes enough for TWO meals. So, you'll want to either freeze half of the dough for another night in the distant future . . . or refrigerate for up to three days. Heat the milk in the microwave as instructed above. Then dissolve the yeast and sugar into the milk by whisking and letting sit for 10 minutes until frothy. Mix the flour(s) and salt together in a large mixing bowl. Use your fist to make a hole in the middle of the flour -- this is where you'll put in the milk mixture. Pour the milk mixture into the bowl with the flour, trying to keep it all in that hole you made. Also pour the oil into the mix. Then with a spatula, gently start to incorporate everything. After a while, you may find it easier to use your hands. You'll also want to add more flour if you find the resulting dough too sticky. It should instead be soft and elastic. Cover the bowl with a piece of lightly oiled plastic wrap. Let rise until doubled in a dark place (approx 1-1/2 hours). Divide dough into two sections. Freeze or refrigerate one section for another meal (each section makes about five large pieces of naan, so you may use it all if you have more people to feed). Otherwise, divide one section into five small balls. Generously flour a work surface and roll each ball until it is very flat/thin. Don't worry -- it'll bubble up and expand once you get it onto the skillet. Heat an iron skillet on high heat (or regular shallow cooking pan) until it is VERY hot. If you have spray oil, that works best, so spray oil on the skillet and place on your first piece of to-be naan. Once the dough is on the skillet, use you hand to sort of swirl it around and make sure it doesn't stick. You will start to see it bubble a bit at this point -- let it bubble, that's the best part. Cook the first side for around a minute, or until you notice it start to brown. You may want to turn down the heat just a bit after the skillet is sufficiently hot, but not too low. You still need it very hot. Flip the naan and cook until the other side is lightly browned. Then brush each piece with some butter or Earth Balance, and serve.